Despite all the snow days and resulting schedule changes, we had a fantastic 2nd trimester in the library! We worked on doing video book recommendations for other students to use to help decide if they would be interested in a book. In March we read books about maple syrup making and talked about the process it takes. We also spent some time thinking about what we would wish for if we caught a leprechaun and students made a rainbow chain of wishes. We buzzed into Spring talking about bees and what they do for us while reading Patricia Polacco’s The Bee Tree. Upper grades thought up ways to help save the bees that are in danger. We need those bees! In April we began focusing on poetry, because, well, it’s poetry month! The older grades have been working hard on making book spine poetry out of the titles of books they can find in the library. Younger students have been doing Spring poetry. Before vacation we had an egg hunt in the library. 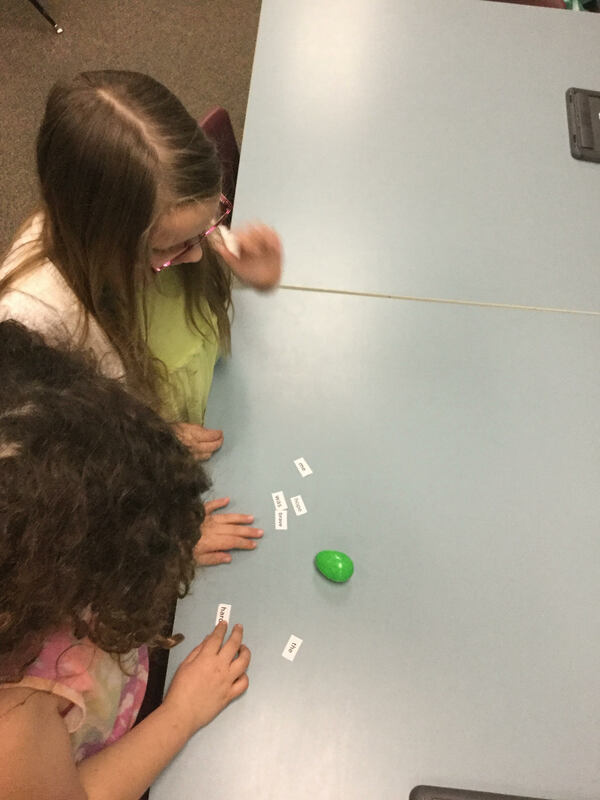 The hidden eggs in grade 3-5 had several Spring words in them and students had to work together to make poems with their words. Grades K-2 found words that rhyme with each other and they had to find their rhyming groups. It was a lot of fun! I am so so excited to announce that after much delay, we are finally getting library classes into the Makerspace once a month to do a STEM challenge. 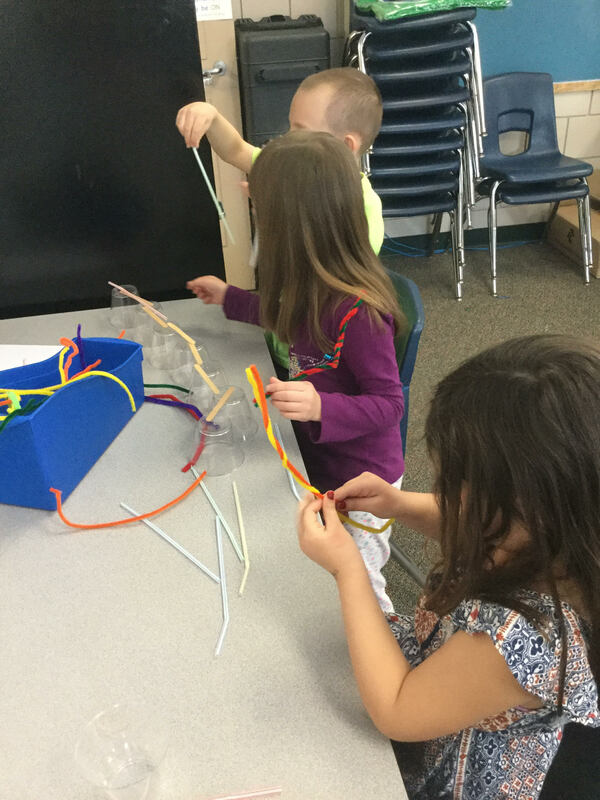 We connect literacy and STEM (Science, Technology, Engineering & Math) by reading a story and then doing a related challenge in the Makerspace. Our first challenge was to build a bridge out of various building, craft and recycled materials after reading the book Twenty One Elephants about testing the strength of the Brooklyn bridge with circus elephants. The kids really really loved it and it was a great way to make connections for them. We will continue to do this library/makerspace time right through the end of the year! Next year in the library you can expect that your child will be in the Makerspace during library time once per month. It’s going to be great! I have been working with the awesome Technology Integrator at Shapleigh and Line School to start planning big and awesome new things for our library next year. I can’t wait to see how much more excited students will be to come to library and to do more reading. Stay tuned! We will end the year with more STEM challenges, learning about engineering and the design process and a focus on reviewing those library skills and having more fun reading! Enjoy the nice weather as it gets better and better. We certainly deserve it!